Each time we take a trip to Gerfalco my Italian other half always utters what I am thinking before I manage to gather my knowledge of the Italian language sufficiently to say what I want to say as politely as possible: why are the streets covered and houses rendered in so much cement? Now there is probably a good reason, but it is a pity as it has left Gerfalco not as aesthetically "pretty" as its other Tuscan hill top counterparts in the metalliferous hills of Maremma. 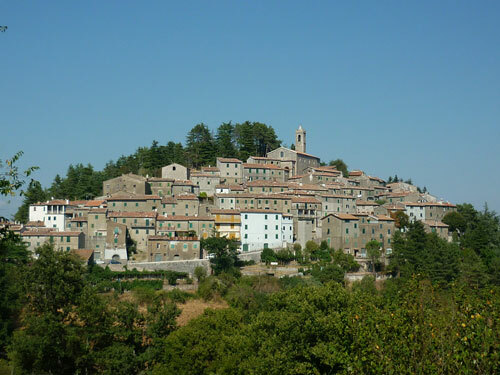 That aside, the town still makes for an interesting stroll, particularly during the height of the heat of Maremma summer, when here on a foothill of the Cornate di Gerfalco (the highest peak in Maremma at 1058 metres above sea level) the air is that much cooler. But a visit is all the more interesting if you know a little of its colourful history before arriving, for it is a gem for lovers of medieval history. The lovely photograph above is by kind permission of Enzo Tiberi. Well rendered in "cement" it may be now, but it was once the prized jewel of Maremma. 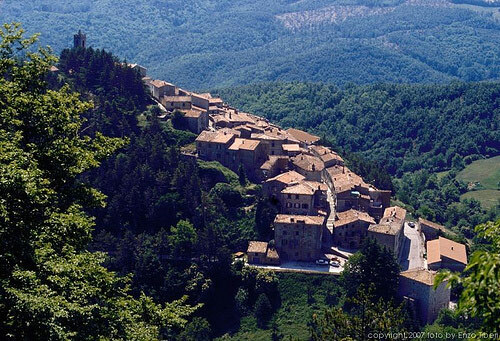 Not only for its strategic high position, but also for the rich veins of silver around the town, in the surrounding hills of Mutti and the Cornate, and at Montececchio. So sought after was rule of Gerfalco and its silver rich lands that its fascinating story includes something I have never (as yet) read about with reference to another castle in Maremma: ownership of its castle, the Castello di Gerfalco, was divided into two even before it was built. And, ownership of those halves changed hands - at one time as a strategic move even between two factions of one very important ruling nobility - so many times as to make your head spin! At the height of its bloody history, men were cut to ribbons for attempting to secretly transfer its ownership. But that is not all: for much of its history, the town, its surrounding lands, and its castle were all owned by different people! Gerfalcho, as it was known in the early fifteenth century, possibly takes its name from the Old High German word "Gerfalke" - for the largest of the falcon species, Gyrafalcon or Gerfalcon. Some anthropologists have concluded from this that the early miners would have been of German origin. At the heart of the violent and pig-pong history of ownership and control of Gerfalco and its castle between Siena and Massa Marittima lies the extraction of the minerals in its hills, but especially the veins of silver on the outskirts of the inhabited part of the town, and the rich cores between the Cornate and the hill of Mutti, and in the locality of Montececchio. 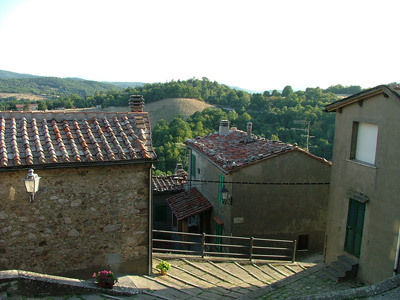 The earliest records of the town date back to the year 896, when the Marquis of Tuscany assigned the territories of Montieri, Travale and Gerfalco amongst other things into the possession of Alboino di Volterra to form his bishopric. Even then, the fascinating aspect of struggle for ownership was set. For, although Alboino was given direct control of the very important and much larger mining territory of Montieri and its town (under whose domain Gerfalco resides today), he wasn't given control of the town of Gerfalco. That, instead was given to his relatives, the Counts of Pannocchieschi, one of the noble ruling families of the day in Maremma. Permission to build the castle in the first place was only granted on the promise of ownership of half. It is the year 1135 and Gerfalco doesn't yet have a castle, but so strategically important is this town, that in giving Ranieri Pannocchieschi possession of half of Monte Gerfalco (Mount Gerfalco) as well as other assets, the Bishop of Volterra Crescenzio includes a clause that if Ranieri constructs one, half of it would be passed to the ownership of the church of Volterra. 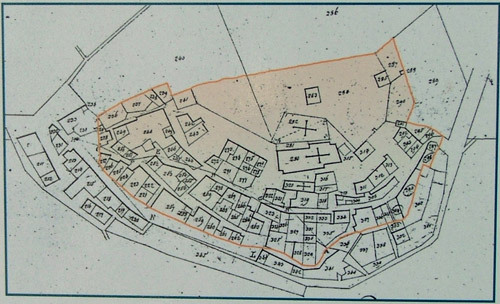 Ancient land registry map of the Castello. Although the shape of the historic heart of the town follows the original castle walls and plan, very little is now recognisable as a castle. 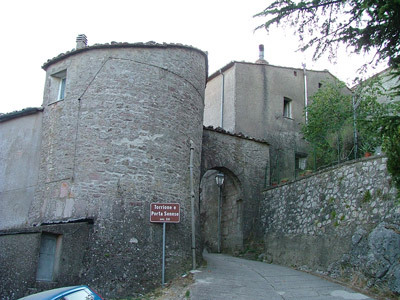 In the twelfth century, Gerfalco was controlled by Galgano the Bishop of Volterra, his relatives the Pannocchieschi family of Gerfalco with whom there is documentary evidence between 1156 and 1162 that he continually disputed their rights of ownership, and the Vicedomini of Massa Marittima! The site is referred to as a "castellum", indicating that the first constructions of a fortification have begun. But during the decades that follow, control of the site is contested between the Pannocchieschi family, the Bishop of Volterra and the Count Lldebrandino VII Aldobrandeschi - a member of a competing noble family in Maremma. To which end, these complex events lead to Galgano the Bishop of Volterra giving ownership of his half of the castle to Count Lldebrandino VII. Towards the end of the century the ownership of the town passed into the sole control of the Counts of Pannocchieschi, who formed a pact with the city of Siena submitting all of their castles in Maremma under that cities control as a strategic move in their battle against the rule of the Guelph's who controlled the strategic city Massa Marittima at that time. But the fourteenth century brings conflict, with Volterra and its bishops, Siena and Massa Marittima each contending for rule of the town and its castle. 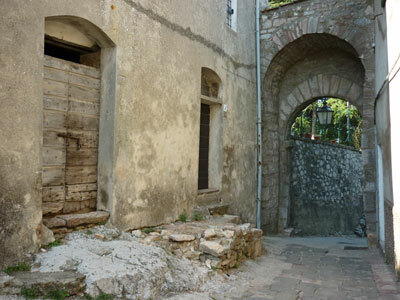 At the instigation of another branch of the Pannocchieschi family, the men of Gerfalco rise and rebel against Volterra and submit themselves to the control of the city of Massa Marittima. In the early fourteenth century, some members of the Pannocchieschi family give shares in their half of the castle to the city of Massa Marittima, thereby giving cause for conflict between Massa Marittima and Siena. 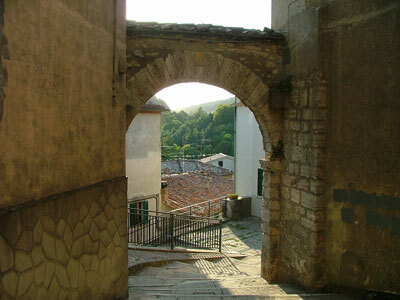 The troops of Massa Marittima quickly occupied the castle and brought in reinforcements. The city of Siena responded with the preparation of an army and attack the Castello under the control of Paolo di Guido Baglioni of Perugia. But they fail to take it. Instead, they make it known and start to move the army to do so, that they intend to besiege the city of Massa Marittima. The threat of war under the walls of their own city was too much and on the 30 June 1318, the Massetani ordered the withdrawal from and evacuation of Gerfalco. Not long after, to support conflicts elsewhere, Siena also withdrew. Some years of relative peace followed. After an undefended coup by Siena exiles led by Gaddo di Guglielmo who settled in the town, it returned under the protection of Siena. The castle was strengthened with two metre thick walls, forts, bastions, two towers and ample water cisterns. In 1453 during the war between Florence and Siena and whilst still under the control of the latter, the town's governor, Alessio Romano, attempted to pass control of the town to the Florentines, but his attempted betrayal ends bloodily. For the Commissioner of the Republic of Siena, Niccolo di Marino, succeeds in foiling his plot and takes Romano and ten Florentine soldiers as prisoners. They are cut to pieces. The defeat of Siena by Firenze placed Gerfalco under the control of the Medici family, but the occupants of the castle held out under extreme conditions in their attempt to remain faithful to Siena. In the end, Cosimo dei Medici ordered the castles destruction and sent Count Gattaia to occupy and destroy it. The men of Gerfalco surrendered, but only after they had secured a pact with Gattaia not to demolish the castle. Despite the exhaustion of the silver mines in the early sixteenth century, the town prospered with around 870 inhabitants until around 1700, when it is reduced to that of a poor village of few houses. Silver mining began in and around Gerfalco in the middle ages and include of a tunnel that meets a shaft of some eleven metres deep in the locality of Podere Montececchio. Most galleries have irregular accesses that follow the natural fissures in the local rock. The shafts, on the other hand, appear to follow the directives of the "Ordinamenta super artem fossarum ramerae et argenteriae civitis Massae", the ground-breaking medieval law contained in the statutes of the mining town of Massa Marittima, which required for safety standards a minimum distance between one excavation and the next. The Gerfalco shafts are circular, with diameters of between 1 and 3 metres, set at intervals of between two and six metres distance. Documents attest to the continued mining of silver and other minerals here throughout the middle ages, and the physical evidence is visible once you "get your eye in" past the vegetation that now covers it. For there are numerous slag heaps around the inhabitated area of the town and in the area of the central Cornate. In 1872, the engineer Emilio Righetti began exploration work to try to trace some new silver veins, but, after some years the surveys of particular interest at locations "Piagge" and "Lanchio" were abandoned due to poor results. You won't have trouble finding a space to park on the "main" road that encircles the town, except that is on annual "festa" (festival) day, when you will be hard-pushed to find a spot anywhere. 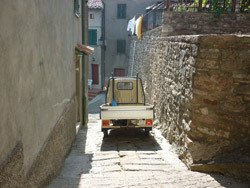 Parking in the historic centre isn't recommended as the medieval streets are very narrow and you'll end up blocking the way for the local traffic! 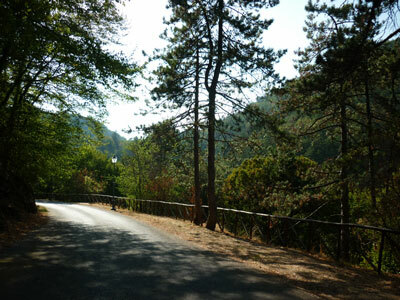 The best option is to drive follow the road that circles the town and park on the northern side in the shade of the woodland. 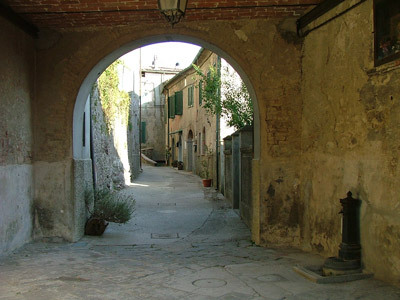 The town's large roomed bar with outdoor terrace - you can't miss it as you drive into the town on your right - is also where the Massa Marittima photography club regularly meets, some members of which have kindly contributed their wonderful images of Maremma to this guide. The annual August festival "Rievocazione della Trebbiatura" (Commemoration of Threshing) is usually held over three days - Friday through to Sunday - on the second weekend in August and includes a lunchtime and dinner "Sagra" served by the local osteria. If you fancy a quiet stroll through the medieval streets don't choose that weekend! 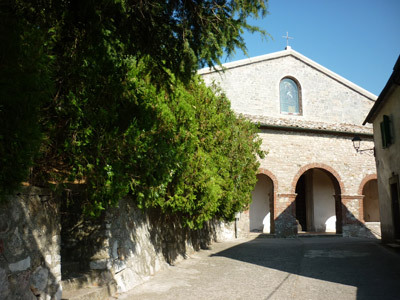 And the end of August/beginning of September the "Festival delle Viole" concerts are held in the "chiesa di San Biagio" (the church of San Biagio) at the top of the town. 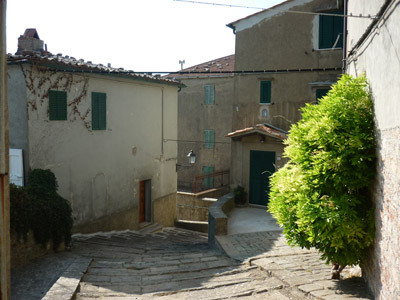 Your nearest options for accommodation are in Montieri (kilometres), Massa Marittima (kilometres) or Sovicelle (kilometres).